Seems like an “abridgement” to me. Anyone challenging the law? Move out of Boulder Co.
No one should be forced to move out of their home because of such an unconstitutional law. I know someone who will not comply. No one should comply. 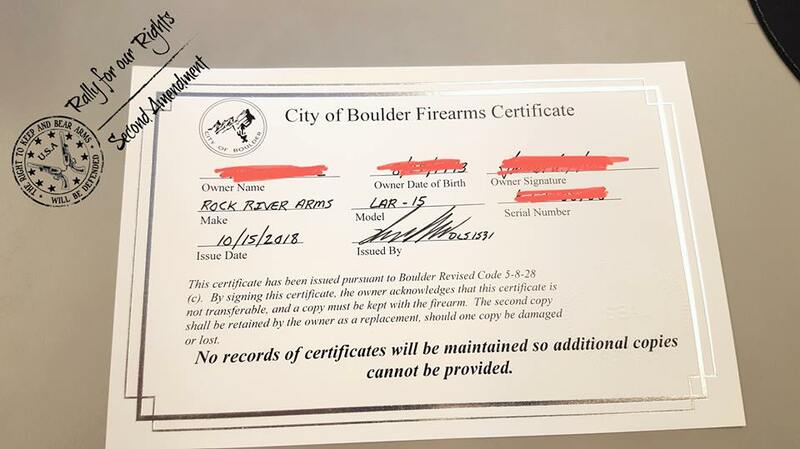 The City Council of Boulder Colorado and the author of this obvious criminal violation of OUR Constitutional rights to be jailed immediately PERIOD, they don’t even have that type of authority anyway! well if your republican and you did not vote . Then you are the problem BUD. They will take everything unless you stand up. But republicans have a problem with voting. So if you lose your guns then you should have voted. How is this different than a Poll Tax? When you have to pay and get permission to exercise your rights, they are no longer rights. I have a conceal carry permit. What happens when I go to Boulder? The democrats have proposed gun bans in many states: CA – Salwell, and NJ Rep Spallone has proposed HR 7115 which is “all parts” ban directed to PRODUCT SAFETY COMMITTEE, and includes advertisement, information/internet, sales and finally CONFISCATION. Signed by many other democrats, it is a huge – guns, shotguns, handguns – vague law – replacement parts will not even be allowed. I believe they are getting ready for a revolt – and I’m so tired of the OLD promise by the left: “no is taking your guns”. Don’t believe a word of it. All these bans include confiscation. And it will ONLY be confiscation from private citizens – as everyone else, including criminals WILL STILL OWN THEM. Apparently Joe you fail to understand what is going on. Socialism (aka communism) is the roots of America and this issue of gun registration is a result of those socialist roots. Perhaps this video on FDR’s “New Deal” much like Ocasio’s globalist New Green Deal will help you get up to speed. Then you can view the real agenda behind gun registration in this John Birch Society video. And, finally a quick lesson in America’s political terrorism to shine a nice bright light on what is really going on in America. Know a scam when one presents itself folks. Since the city will keep no records, it would seem owner “certificates” may easily be created. The city would not be able to detect violations without hiring expert examiners to perform forensic analyses. Anyone coming under suspicion would have ample time to simply — run to Denver. This whole circus was invented and implemented by a moronic mob of pettifoggers who hate guns and believe they should control the citizens. As a footnote, it seems the citizens are smarter than the bosses and consequently, only the very stupid will comply with this law. The smart ones will simply hunker down, keep their “listed” arms hidden until this insanity goes the way of Canada’s long gun registry and Maryland’s ballistic fingerprint disaster. Even the democrats know this is a tyrant-to-be dream intended to garner votes and not increase public safety. They know Boulder is a safe place to live and the peril exists only in their imagination. Government is pushing Americans into civil conflict through the age old process of divide and conquer. They (on the dark web) are openly discussing the manifestation of what they call race war. Make no mistake about it once you register your guns they will come for them as they have throughout history time and time again. Oddly enough citizens are divided strongly upon this issue and most people think other types of people can have their right to guns taken away for some reason which is not defined in the 2nd amendment and those people who think like this are now under pressure to surrender also. The definition of inalienable is that you cannot give away, surrender, trade, or have the inalienable possession taken or sanctioned by any person or authority. The fact that citizens have desired and allowed for guns to be taken from a single person for what they consider to be a reasonable sanction is why you must now surrender your right also. Governments prey on the weak and divided therefore division politics are why you are here at this junction being requested to surrender. Division politics are on everything you can tune into on the internet and TV for a reason, see how good it’s working. I’m a conservative that has some liberal things I enjoy and I have been watching liberals push gun control for over 35 years and now that we are at the point of surrender or resist I find it amusing that liberal Boulder is resisting the same gun control that liberals are and have been pushing. Please allow me to make this Patriot Point, the Government will kill you liberals just as fast as they intend to kill off conservatives so perhaps we both have some common ground to build upon prior to the conflict they are bringing to all of our doors. If we allow them to push us into the upcoming civil conflict then we get what we deserve. FEMA camps will be opening soon for both liberals and conservatives. If surrendering suits you then so be it but perhaps you should view this video first. New Mexico Sheriff’s declare 2nd Amendment sanctuary counties. Red flags are unconstitutional both at the federal & state level. The case of Marbury v. Madison (1803) was the first time the U.S. Supreme Court declared an act of Congress to be unconstitutional. (The case concerned a section of the Judiciary Act of 1789.) In his opinion, Chief Justice John Marshall relied almost exclusively on the specific language of the Constitution, saying that it was the “paramount law of the nation” and that it constrained the actions of all three branches of the national government. The whole point of a written Constitution, Marshall asserted, was to ensure that government stayed within its prescribed limits: “The powers of the Legislature are defined and limited; and [so] that those limits may not be mistaken or forgotten, the Constitution is written. ” In cases where a law conflicted with the Constitution, Marshall wrote, then “the very essence of judicial duty” was to follow the Constitution. It has been written into USSC opinions time and time again that Americans do not have to comply with laws contrary to the supreme law of the land known as The Constitution. Many such USSC opinions exist. Anybody can write letters on a piece of paper and demand it be adhered to but that doesn’t mean you must comply. In fact if the letters on paper do not comply to the law of the land it is our duty to reject it. Know a scam when one presents itself. Look what we have here, another USSC opinion from my files. The petitioner stands convicted for violating an ordinance of Birmingham, Alabama, making it an offense to participate in any “parade or procession or other public demonstration” without first obtaining a permit from the City Commission. The question before us is whether that conviction can be squared with the Constitution of the United States. blocks. The purpose of their march was to protest the alleged denial of civil rights to Negroes in the city of Birmingham. The marchers stayed on the sidewalks except at street intersections, and they did not interfere with other pedestrians. No automobiles were obstructed, nor were traffic signals disobeyed. The petitioner was with the group for at least part of this time, walking alongside the others, and once moving from the front to the rear. As the marchers moved along, a crowd of spectators fell in behind them at a distance. The spectators at some points spilled out into the street, but the street was not blocked and vehicles were not obstructed. The petitioner was convicted for violation of § 1159 and was sentenced to 90 days’ imprisonment at hard labor and an additional 48 days at hard labor in default of payment of a $75 fine and $24 costs. The Alabama Court of Appeals reversed the judgment of conviction, holding the evidence was insufficient “to show a procession which would require, under the terms of § 1159, the getting of a permit,” that the ordinance had been applied in a discriminatory fashion, and that it was unconstitutional in imposing an “invidious prior restraint” without ascertainable standards for the granting of permits. 43 Ala.App. 68, 180 So.2d 114, 139, 127. The Supreme Court of Alabama, however, giving the language of § 1159 an extraordinarily narrow construction, reversed the judgment of the Court of Appeals and reinstated the conviction. 281 Ala. 542, 206 So.2d 348. We granted certiorari to consider the petitioner’s constitutional claims. 390 U.S. 1023. You have heard me state it before and now you get to hear it again; Know a scam when one presents itself folks.